The STM32746G-EVAL evaluation board is a complete demonstration and development platform for STMicroelectronics ARM Cortex-M7 core-based STM32F746NGH6 microcontrollers. It features four I2C interfaces, six SPIs with three mutiplexed simplex I2S interfaces, SDMMC, four USARTs, two CANs, three 12-bit ADCs, two 12-bit DACs, two SAIs, 8- to 14-bit digital camera module interface, internal 320+4 Kbytes SRAM and 1 Mbytes Flash, USB HS OTG and USB FS OTG, Ethernet MAC, FMC interface, Quad-SPI interface, JTAG debugging support. 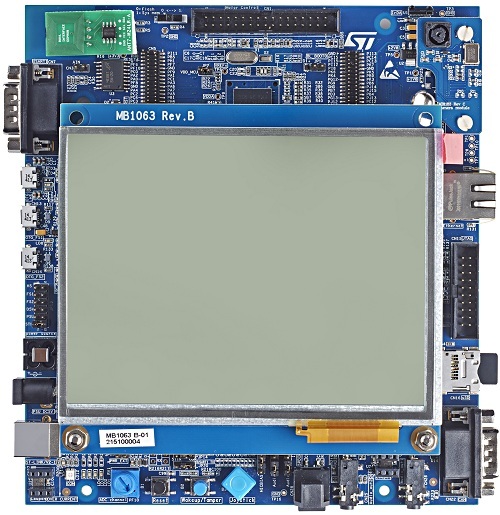 This evaluation board can be used as a reference design for user application development but it is not considered as a final application. The full range of hardware features on the board helps the user to evaluate all peripherals (USB OTG HS, USB OTG FS, Ethernet, Motor Control, CAN, microSD Card, USART, Audio DAC and ADC, digital microphone, IrDA, RF-EEPROM, SRAM, Nor Flash, SDRAM, QuadSPI Flash, 5.7" TFT LCD with capacitive touch panel and others) and develop his own applications. Extension headers make it possible to easily connect a daughterboard for specific application. The integrated ST-LINK/V2-1 provides an embedded in-circuit debugger and programmer for the STM32 MCU.